Our whole family seems to have settled into 2019 nicely. The girls are busy with volleyball, basketball, tennis and piano, as usual. 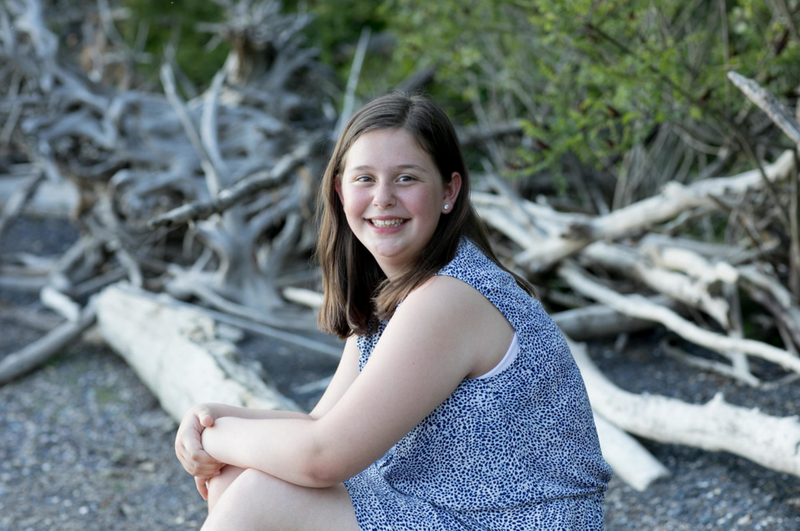 Mid-terms are over for our highschooler :) And thank God for that because she had 5 days off in a row due to exam scheduling. The new year boom for our business is slowing down and we are on-boarding 3 new couples. So excited about that! Personally, I am working on eating healthier by cutting out sugar and processed food. Why do I ever let those items creep back in? I feel so focused and on top of everything without them. Now, if the snow would just melt a little I would be out walking each day too. Thankfully my bike fits on a trainer in my office. I can feel Spring coming. I know it will be here by, oh May, I hope. As we close in on spring and wedding season it’s also a time when a lot of our clients are working on invitation design and with that the question always comes up…. I’m going to start with a similar first line to the one I used in last weeks blog when we discussed your RSVP date. Our full planning brides do not have to ask when they need to send their invitations because it’s always added into their planning checklist but it is something we often discuss. I was just chatting with one of my brides about this topic the other day. I picked the send date for her that seems appropriate for me and her invitation designer had a slightly different one. This happens all the time and that is OK. It gives us the chance to chat about the pros and cons and which date works best. One of the first things I try to avoid when suggesting a send date are holidays and big vacation weeks such as the time between Thanksgiving and Christmas or the week of July 4th. Most invitation designers suggest that you send your invites out about 8 weeks before the wedding. This would be considered proper etiquette in many circles. I like to suggest 10-12 weeks before the wedding. The reason for my send date suggestion is that we like you to have an earlier RSVP date than your invitation designer suggests. And it all comes back around to when your vendors need their numbers by and how many guests you might have to track down when they forget to respond. Also, don’t forget that a lot of your hotel blocks pull the discounted rooms about 60 days before your wedding so if you send them 8 weeks out and your guests haven’t booked a room yet, they may lose their discount. While there is no perfect answer I always suggest that we compromise and fall somewhere in the middle of 8-12 weeks period before your wedding day. The earlier your invitations go out, the earlier you have your RSVP’s and the less stress on you as we get closer to the big day. Greetings! Vermont truly feels like a winter wonderland this week. The trees are still covered in snow and thankfully the roads are once again clear from all that snow. We were hit with quite a few inches, or feet, last week. Our girls and the other kids in the neighborhood are back out sledding after school and sports each day too. I’ve been so thankful for the blue sky and sunshine these last few days. It just brings Vermont to life. And honestly, it brings me to life too. There is something about the winter sun that feels so good. Thinking of all of this sunshine has brought my thoughts right back to summer and wedding season. A lot of clients are getting ready to send out their save the dates and invitations. Let’s break it down to a single tip about invitations today. My full planning brides don’t usually have to ask when to schedule their RSVP date because it’s always added into their planning checklist but it is something we often discuss. Often you’ll be told, or read, that the date should be four weeks from your wedding day but that just doesn’t work for me and here is why… the dreaded “non-replier’s'“ you know, the stragglers. It kills me. The reason others suggest the four week mark is because most of your vendors need your guest count right about that time. As I mentioned though, it’s hard to get that number if you have a dozen or more guests that have not replied. This happens all the time. I would go so far as to say we have never had a wedding where everyone has replied on time. My best tip to you on picking an RSVP date is to make sure you give yourself enough time to contact all of the guests who do not reply on time. Sometimes it’s as easy as a quick text or email but we have seen it take weeks to get those responses. It’s important to have an accurate number for your vendors. More importantly, just imagine how it feels when that guest who forgot to reply shows up on your wedding day and there is no seat for them. Often it’s not a single guest but a couple so now we need to make room at tables that are already full for two guests. Obviously, we would handle this dilemma, and have, on a moments notice but it’s definitely an uncomfortable situation for the guest at that time. Now let’s get back to the date. My suggestion is to have an RSVP date that is at least 6 weeks before your wedding. You will not regret it! Let’s start planning your wedding today! Reach out to me through the button below. Happy 2019! Greeting from a snow covered Vermont. I can not believe another year has come and gone. So much is changing for us as our business continues to evolve into all it’s meant to be. You’ll see some of those changes coming later this year. We’ve been on this journey since 2003 and I can’t image doing anything else. Currently, we are focused on planning with our current 2019 brides and even have 2020 inquiries coming in… 2020! Since it is January we are still working on the big details like securing vendors and working through some of the bigger decisions but soon we move into the really fun stuff like small details that personalize each wedding AND all the timelines and spreadsheets for budgets and replies. Eeeeek! I love the spreadsheet as much as I love helping you design your day. Let’s move on to the very first Tuesday Tip from me, Randi Nonni, for 2019. WooHoo! Did you read that title wrong? No. I’m telling you things will go wrong on your wedding day. Last night I was talking to a groom who said those exact words to me “I’ve been to enough weddings to know that things will go wrong on my wedding day.” He’s right. Then he added, “We just don’t want to know about any of it” Ahhh, that’s it! That’s the key to a great day… not knowing what might be going wrong behind the scenes. That is exactly where we come in. This is our strong suit. Peter, my husband and business partner, are at all of your weddings together. We are the foundation of a solid team of planners. We solve issues that come up or make decisions that need to be made in the moment when it’s happening. We take care of it for you. See that sweet photo above of our bride and her Dad taken at Trapp Family Lodge? Right before this was taken, the brides flowers ended up locked in a room with no key. Thanks to our quick thinking assistant, Lucy, the crisis was diverted and all went off without a hitch but maybe 5 minutes behind schedule… which we made up later. It just happens. We are there to take care of it. Besides us, your vendors are there too. Together we hire the best vendors possible to work for you and with them we smooth over any issue that comes up. At the end of the day we there for you, your best interests and your vision. Those three things are always at the forefront of our mind. The comfort of your guests and their needs is a very close second. We always have your back so you can sit back on your wedding day and know that everything is taken care of. Your needs and creating a seamless experience on your wedding day are our top priorities. Let’s start planning your wedding. Shoot me an email through the link below and we can start today! Wow! It’s been 6 months since I last blogged. Summer came roaring in and our official wedding season was off an running. It’s been the best summer! We worked with a handful of select couples and their families to bring their Vermont wedding to life. It was a true honor to work along side these amazing couples. We made our way all over the state from Burlington to Woodstock to Warren to Stowe and all they way up to South Albany. We were blessed to work with many families at their private residences each a unique and beautiful setting in the heart of Vermont. We also worked with several extra special, unique venues including the Stowehof, Trapp Family Lodge, Strawberry Hill and the UVM Alumni House. Personally, Peter and I had time to spend with our girls, Madelyn and Mirabelle, pictured above. We made it to some of our favorite vacations spots this summer Scituate, MA and Ogunquit, ME. 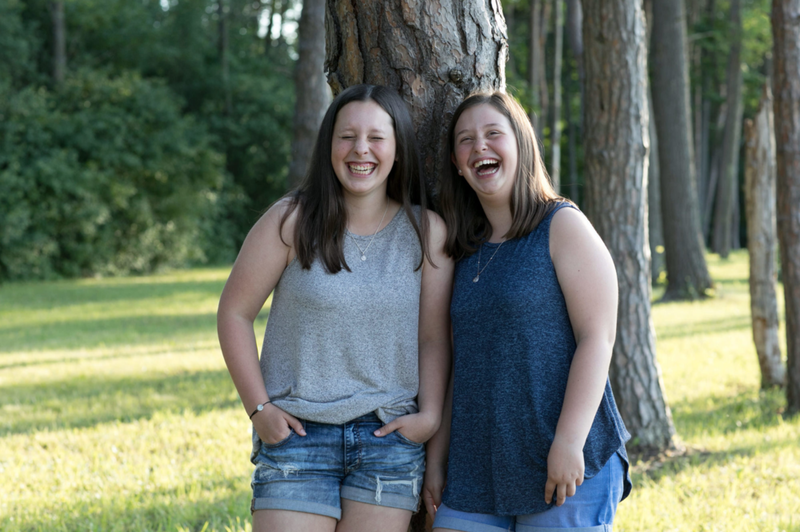 These images featured above were a special gift from one of our dear friend Amanda Herzberger of Orchard Cove Photography. She not only does killer family photos but is always available to capture the special moments of your wedding day. She is truly awesome! Peter was not able to make this shoot but I swear, he is real. And if you work with us you will get to know him. He’s a big part of our weddings. More on that later. One of the highlights of our summer was the Patterson Family reunion in New York. It was a weekend filled with love and laughter and about 50 members of my crazy family, who I love dearly, especially Auntie June, she’s everyone’s favorite :) They came in from all over with my brothers family coming all the way from the Philippines. Now that summer is over I find myself back at my desk full time working with new couples for next year. It’s also a time that I get to reflect on all the weddings from 2018 as the images come pouring in from our photographers. I’ll be sharing them all very soon. Time moves so fast these days. I just can’t believe 2018 is coming to an end… but not before Christmas!! :) I’m thankful for the families that came into my life this past season and I’m excited for what is ahead of us as the 2019 wedding season gets closer. We will be blogging this winter about each of our weddings and getting back to our Tuesday Tips. Spring is here! Really, really here! I won't even tell you that it snowed last week... we need to put that behind us and move on to sunny blue skies and lilacs. Is that too much to ask for in May? :) Our last entry was on bar service and what the laws are for a private home wedding in Vermont. As promised this week we will chat about the reasons I truly think you should hire a professional bar service even if you don't technically have to. 1. A professional bar service will be able to guide you through the process of what is needed to fully stock the bar. They understand what to buy and how much is needed. They will come with everything it takes to make the day work and flow smoothly from the best local craft beers to your favorite wine, maybe your Dad's favorite scotch right down to the lemons, limes, cucumbers and mint. 2. A professional bar services will set up and clean up for you. They will keep the bar area looking clean and organized. They will haul away all the bottles at the end of the night too. Take it from someone who hauled over a dozen very heavy barrels of bottle to the street after one wedding... this is huge! Not to mention, they are fast and efficient at what they do and keep your guests happy while moving them along so they can wait on the next guest. 3. Your professional bar service comes with an added bonus too which is a liability insurance policy. They are licensed by the state and properly insured. This comes back around to the homeowner too... last week we talked about the reasons why you wouldn't need to have this service but this might be the biggest reason why I would chose to use them. 4. These bar services serve responsibly. All of the bartenders and bar backs have been trained by the state. They are able to detect when a guest may have had enough and when it's time to shut someone off. They have no feelings involved, which is what you need. It's a matter of keeping your guests safe and obeying the laws. I know, some of you are still like, but Randi it might save us some money! How hard could it be? Let's also hear from Lindsey Leichthammer, the Director of Catering for The Farmhouse Group, who offers superb catering and bartending services throughout Vermont... she has a way of explaining it too. "There are a few reasons why it's best practice to hire a bar service for a wedding on your home and/or property. The first of which is safety. Bartenders aren't just there to pour your Moscow Mules, they provide trained supervision of your guests and monitor consumption for the safety of you and your guests.. Leaving your wedding guests open to judge their own consumption in such a festive environment can lead to many issues: from Uncle Billy asserting his dance moves with his tie securely around his forehead to more serious accidents or drunk driving. Second - stemming from possible accidents - is liability. Bar services are equipped with liability insurance to protect those involved. Otherwise the homeowner is subject to liability for anything that should occur where liquor is being served. Lastly, time is money. A big motivator for the DIY bar is "I can go to New Hampshire, skip the taxes and avoid the markup" However, that also requires transport, storage, chilling of product at east 24 hours in advance (and the ice to do that) ice on the day of (4-600lbs!) the cleanup, recycling removal, etc. Throwing a backyard BBQ for 30 guests and supplying the bar is one thing, but a formal or semi formal affair with 200 of your closest pals is worlds away. Remember that time is money - Don't underestimate how long it takes to secure, set up, break down and clean up any alcohol related items. Having a bar service move everything IN and OUT, as well as provide service to your guests throughout the event, may relive numerous headaches and stress. The week of your wedding, you want to be focused on hosting all of your friends and family, not becoming frantic about foamy kegs with party taps." And there you have it. Words of wisdom, not only from me, but also the legendary Lindsay Leichthammer who besides running the catering division over at Farmhouse Group is also the President of Vermont Association of Wedding Professionals. See! She's a Vermont Wedding Industry Superstar! I wouldn't quote anyone less. Take it from us, hiring a professional bar service on your wedding day might just be the best thing you could do! You'll thank us later. Do We Need To Hire A Bar Service For Our Vermont Wedding? Today's tip is short and sweet. Did you know that there are four dry towns in Vermont where the sale of alcoholic beverages is prohibited? I didn't. These towns are Athens in Windham County, Baltimore in Windsor County, Holland in Orleans County and Maidstone in Essex County. 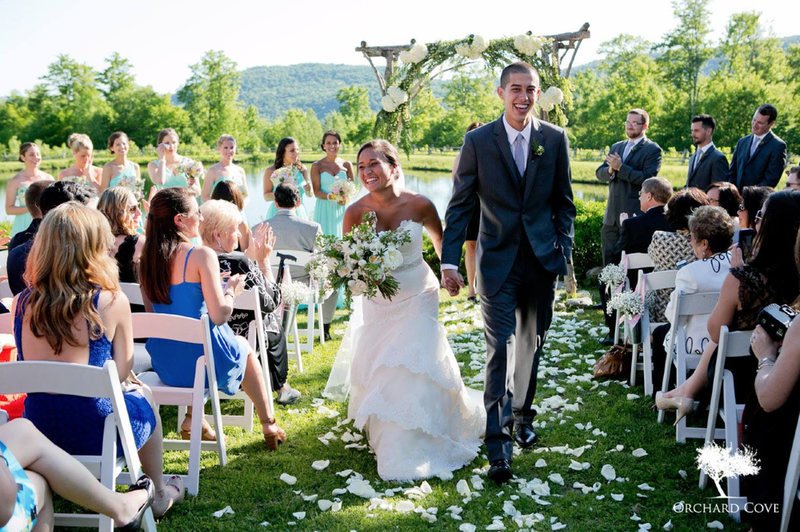 This information can come in handy when planning your wedding in Vermont. More tips on the Vermont liquor laws next week. Let's face it, weddings are expensive. We often have couples ask us for ways to save money on their day so that they stay within their budget. They've often been told by a well meaning friend or family member to ask for local, 'in season' flowers... this does not save you money in Vermont, that is for sure. It's been suggested that they just purchase a 'cutting sheet cake' but really, it's your wedding day. Do you want to serve a sheet cake? I've heard that you can cut back on food... just no, to this suggestion. You do not want hungry guests who spend the night drinking more to fill themselves up. Most of our clients have a vision, "the vision", the one that they have been planning and dreaming about. Expectations are high on your wedding day. You want it as close to perfect as possible. This is probably the most expensive celebration you will ever have. So how do you save on your wedding day without drastically compromising on your vision? You cut the guest list. It's as simple as that, you cut back the number of guests you plan to invite. Let me give you an example of how this breaks down. If you have a budget of $75,000, which is pretty average; and let's say you have and estimated 150 guests. That's a budget of about $500 per person. As you are talking to vendors you realize that in order to have the day you want you are going to need at least $80,000. So where do you cut to get the budget back into the 75,000 range? Do you cut out the stationary appetizer table? No, that's definitely not going to make for happy wedding guests. Do you cut the photographer? Obviously not. Do you go with a cash bar? Guests will probably not appreciate that either, after traveling all the way to Vermont. So the easiest thing to do is to cut your guest list back by a few. If you cut 10 guests you would have approximately $4,000, maybe a little more. You wouldn't have $5000 extra because some of your pricing is fixed like your venue, attire or photography costs. But you would save on food, bar, flowers, linens, tables, place settings and transportation not to mention favors and invitations. Every little bit counts. And you wouldn't compromise your vision. So remember... when looking to save on your wedding day consider cutting the number of guests before you consider anything else. A black tie optional wedding at Hildene. Photo by Daria Bishop Photography. The Wedding Dress Code. Black Tie Optional or maybe it's Festive Cocktail Attire. Those little words on the bottom of the invitation that hold so much weight. What do they mean? Which one should you choose for your wedding? Do you need one at all? Assigning a dress code to your day is definitely not mandatory but it does help your guests to know what is expected of them. Let's break it down below. White Tie is the most formal and I'm betting we won't see many of these at Vermont weddings. White tie is mostly reserved for royal weddings, (Still waiting on my invite for May 19th) and diplomatic galas. We would see the ladies in formal full length ball gowns and the gentlemen in tailcoats with a white waist coat and white bow tie. Black Tie means this wedding is a formal affair. Black Tie is not as strict as White Tie but does have a few rules. The gentlemen would be wearing a black tux, style of their choosing and the ladies would be in a formal full length gown or very fancy cocktail dress. Here in Vermont we often see Black Tie Optional weddings. If you find this dress code on your next wedding invitation you should choose formal attire. The wedding party will most definitely be in full length gowns and tuxedos. Gentlemen would have the option to wear a nice suit, preferably dark in color, or a tuxedo and the ladies would again, be in a full length gown or cocktail dress. All three of these codes mean very similar things. Your bride and groom are hoping you join them in festive attire that is not black tie. We would suggest a nice suit, in any color, for the gentleman with a neck tie or bow tie of your choice and a cocktail dress for the ladies. We don't see many Casual Dress options for our weddings in Vermont but if you do, feel free to wear anything at all, within reason. Ladies may want to wear a causal dress or maybe a sundress while the gentlemen could be in a button down shirt, with no tie, jacket optional. If you choose to apply a dress code to your wedding make sure to chat with your invitation designer so this little detail does not get missed. I look forward to hearing which one you choose. Reach out today so we can talk more about the dress code options and how they may apply to your day. Click the button below to start the conversation. Greeting from a STILL cold and snowy Vermont. Are you wondering if I wrote this a few months ago? Nope, it's March 20th. But don't you worry, Spring will be here, soon, maybe, I hope. Sometimes winter likes to hold on here for the skiers but I do hope the daffodils are popping up very soon. Last week we chatted about the Groom's attire. Without a doubt, I feel like this subject is just as important as what our bride is wearing. So let's continue on the topic of Groom's attire. Last week we chatted about wearing a suit to your wedding. This week we will focus on the tuxedo. The tuxedo is the formal brother of the suit. When deciding to wear a tuxedo on your wedding day you should consider the location of the wedding and what the bride is wearing. Typically the only difference between a suit and a tuxedo is the presence of silk satin lapels and stripe down the side of the trousers. So, should you wear a tuxedo? There are no hard fast rules anymore but usually tuxedos are worn on very special days. Your wedding day is that very special day. There is nothing quite as sharp as a custom made tuxedo like the ones you see on Alexander and his brothers, in the above image. Once you decide to have a tuxedo custom made, you will need to work with a designer on the stye that you like best. But don't worry, they will walk you right through the process and the fittings. You will also need a few accessories to complete the look. You will need to decide on the type of jacket lining you like best to really personalize the look along with a formal collared shirt; the most common options being the the wing tip or spread collar. You'll also need to decide on the cuff style, sock and tie options. For cuffs, I personally think the french look very sharp. As for ties, while there is no rule you must wear a bow tie with a tux, you should. A bow tie just looks great. It's a statement piece to pull the tux together. Traditionally you would go black or white but these days patterns are very popular too. And from here you can talk to your tuxedo designer about suspenders, shoe options and pocket square among other things. Consider the tuxedo an investment, just like a wedding dress but with a big perk. With a tux there is a good chance you will wear it again, like at your next black tie affair, where as wedding dresses are often cleaned and tucked away for safe keeping and future generations. Of course, renting a tuxedo is always an option. If you decide to rent, reach out to a local tuxedo rental shop in your area for help with the process. That last statement brings me to our topic for next week... Dress Code. 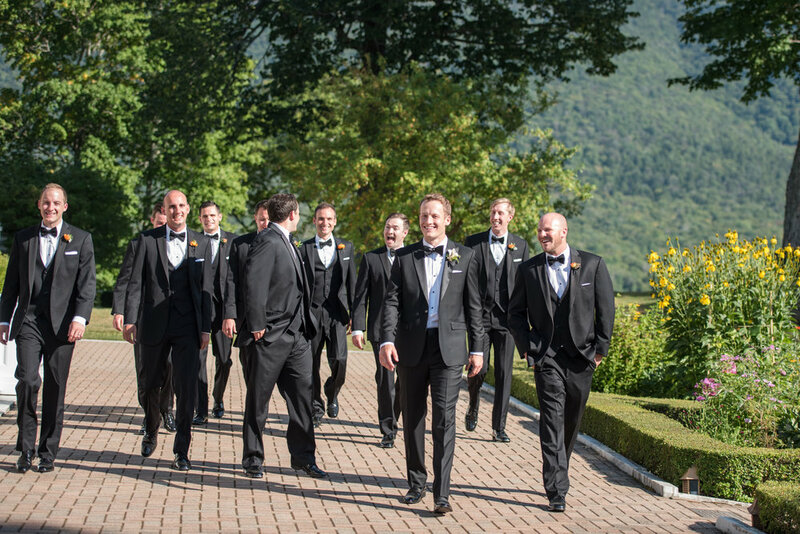 One of our recent grooms highly recommended 9Tailors in Boston for custom tuxedos.